Holiday Portrait is a collection of photos of umbrellas on an ocean beach near Pachino, a small village in Sicily, taken with a Hasselblad 500 on 6x6 film. 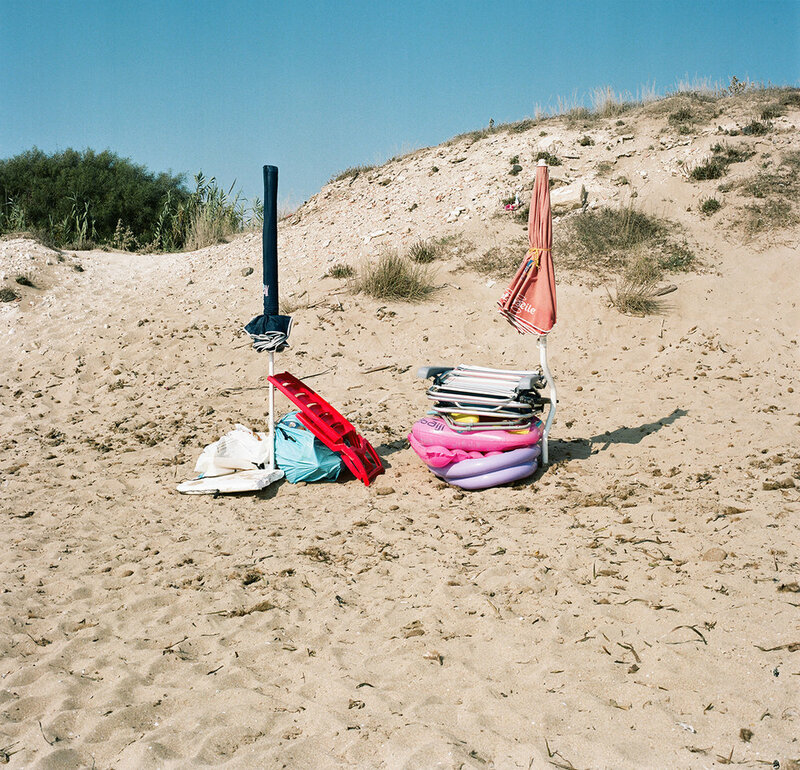 By photographing the seaside site "under the umbrella" while the bather is away, Ludovica Anzaldi captures the inner life of the absent bather. The umbrella becomes an extension of its absent owners; the nature and location of the objects within its shade tell the story of the owners' day, and describe their affections, taste and relationships. Looking at the images, one can perceive the presence of invisible human beings, and how connected they are to the things they left on the shore. Through this series of photographs we realize how, in this part of Sicily, the locals live the ocean beach as if it were their home. Without been seen, the photographer enters the intimacy of their homes, and allows us to peek inside them and imagine the lives of people that are temporarily absent and yet very much present. Ludovica Anzaldi is an Italian photographer currently based in Paris, France. She grows up in Italy, between Rome and Sicily where she comes from. After attending an artistic high school in Rome, she moves to Paris. In 2012 she attends the Parisian School of Photography Speos, and after she takes an internship as archivist at the Magnum Photos Paris. In 2014, she starts attending the ESAG Penninghen, the School of Artistic Direction. In her images, Ludovica Anzaldi, tries to represent the human being in all his complexity, his darkness, his poetry, his sensuality. She choses to shot women bodies to illustrate her purpose because it’s through their curves that Life happens. On each image, her models share a piece of their existence, in which the viewer can easily find himself. Is travelling inside one’s intimacy, getting at the source of our own genesis. Through this questioning she proposes many different ways of life. You can view more of her work here.